Giving you a $100 ad credit as soon as you sign up, Yahoo! Small Business is a great webhost to get you making noise online as quickly as possible. 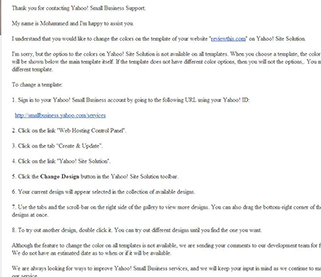 Claiming that everything you need is already included in its interface, Yahoo! Small Business offers its proprietary site builder to get your site up and running quickly—even if you have no prior experience in site design. In fact, Yahoo! Small Business gives you a step-by-step guide and checklist to help you make sure that you have everything you need. And even if you do run into trouble, Yahoo! Small Business’s customer service is always there to help you out of a jam. Living up to its name, Yahoo! Small Business could give you everything you need to get online, noticed and profitable in a hurry. As mentioned above, Yahoo! Small Business may have some of the most helpful features for people with no experience in webhosting. With a proprietary website building tool, you can utilize templates to quickly create a professional, attractive site that meets all of your needs. Drag-and-drop functionality lets you move the features you want wherever you want on the page. Perhaps even easier than building the site, creating an email address for your domain involves a single step: choosing a name for your account. The site will automatically give you a password that meets all of its security requirements. Obviously, the best feature of Yahoo! Small Business is its ease of use, even giving you a step-by-step check list while you build your webpage. Especially for first timers, this can ensure that you don’t forget a crucial component of your website while you’re getting started. With customizable templates, building your page can be as simple as clicking on the features you’d like to add or remove. In addition to your easy-to-use site builder, you’ll gain access to some of the most important web hosting apps. Yahoo! Small Business offers its own versions of photo galleries, user forums and maps, which are often comparable to more well-known 3rd party plugins. With premium plans, you’ll also have access to WordPress blogging, which is one of the most common content management interfaces on the web. For more technical webmasters, you’ll have access to coding functions with PHP and Perl, as well as MySQL databases. 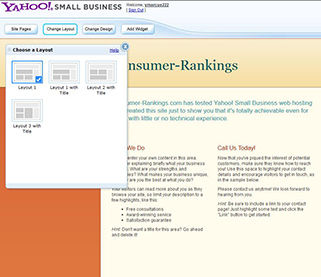 Of course, if you’re looking for eCommerce solutions, Yahoo! Small Business has them in spades. Supporting over 30 shopping platforms, including Shopify, Magento, Bigcommerce and Volusion, you should be able to find an eCommerce solution that works great for you. You can also integrate with Google or Bing shopping, which can plug you into some of the most popular interfaces in the world. If you really want to start selling, though, you’ll have to let people know how to find you. Fortunately, Yahoo! Small Business is completely ready to handle all of this, giving you $100 in advertising credits with all of its packages. Every package also automatically submits your site to Yahoo!, Google and Bing to allow people all over the world to find your site. Offering 24/7 technical support by phone and email, Yahoo! Small Business is prepared to make your webhosting experience as accommodating as possible. In fact, Yahoo! Small Business has a convenient call back function, which allows you to request a phone call and avoid waiting on hold. In general, all of Yahoo! Small Business’ sales and technical support representatives were nicer and more knowledgeable than typical support staffs. The company also claims to be able to answer customer emails within 24 hours, which is an impressive turn around for such a large company and such a popular service. Despite its name, Yahoo! Small Business could work just as well for personal sites. In fact, its lowest-cost plan starts at $3.74/month, which is affordable on almost anyone’s budget. Yahoo! Small Business offers a couple more advanced plans, which are better designed to handle eCommerce websites. For $5.99/month, the advanced plan offers 5 times as much storage space as the basic plan, while the premier gives you unlimited storage for $8.99/month. Yahoo! Small Business sweetens the pot by adding a 30-day money-back guarantee on all of its hosting packages. 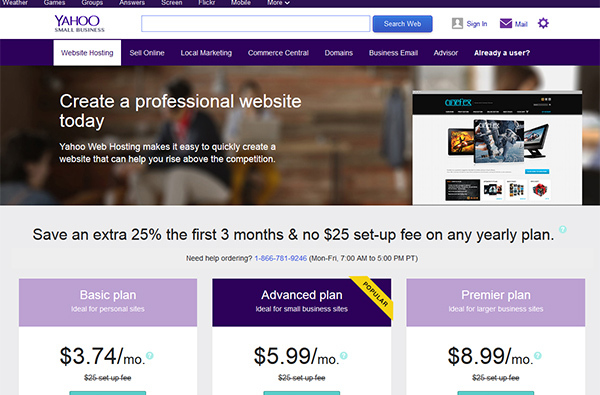 If you’ve been searching for a full-service webhost, Yahoo! Small Business could provide some helpful and inventive features to really get you started. 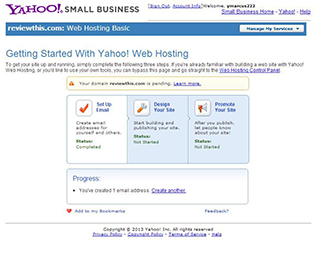 With proprietary versions of some of the most popular website building and content managing softwares, Yahoo! Small Business should have everything you need right out of the box. Yahoo! Small Business also accommodates people with many levels of webmaster experience, equally adept at point-and-click template building as it is with coding and databases. Best of all, with a 30-day money-back guarantee, you have nothing to lose with Yahoo! Small Business, but everything to gain.